Description: RSE carries out research into the field of electrical energy with special focus on national strategic projects funded through the Fund for Research into Electrical Systems. It is an entirely publicly owned joint stock company, part of the GSE Group, and is supervised by the Italian Ministry for Economic Development. RSE develops applied research in the electricity/energy sector and provides the Italian system with the expertise and know-how it has acquired from its extensive experience and the long tradition of research in Italy. The activity covers the entire supply system with an application-oriented, experimental and system-based approach. RSE has a unique heritage of human resources , experience and innovation, essential to the continuity and revival of innovation in this important sector for the country. The company carries out research projects of general interest, with an essentially applicational and experimental slant. This research aims at developing new initiatives to provide concrete solutions to the needs expressed by stakeholders, the market and the general public. RSE’s research focuses on all aspects of the production system, central and local public administration, associations, groups of small and medium-sized enterprises, and consumer associations. RSE’s strategic goal is to promote and encourage the growth of tomorrow’s professionals, by supporting the training and education of young researchers according to their skills. RSE is active in several international network and technology platforms as the European Industrial Initiatives on Electricity Grids (EEGI, GRID+ coordinator) and Wind Energy (EEWI), the Joint Programme of the European Energy Research Alliance (EERA) on Smart Grids (as JP Coordinator) and Storage, and Implementing Agreements of the International Energy Agency (ISGAN Chairman and ISGAN/SIRFN member). It is also active in the CEN-CENELEC-ETSI Smart Grid Coordination Group and in several IEC and CIGRE’ working groups. RSE has a noticeable experience in research and experiments on Smart Grids, DER characterization and integration in distribution networks. Among the others, RSE has coordinated the I3 project DERri, under the EC Research Infrastructures program. 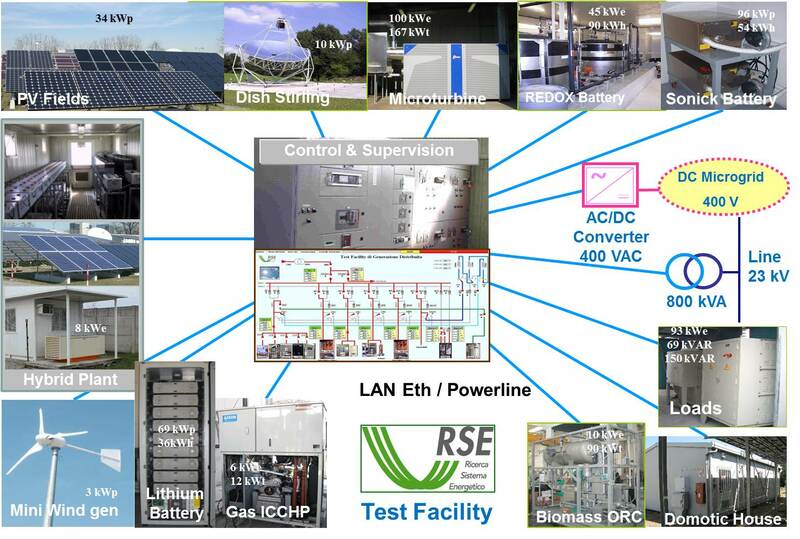 Description: RSE DER-TF (Distributed Energy Resources Test Facility) is a real low voltage microgrid that interconnects different generators, storage systems and loads to develop studies and experimentations on DERs and Smart Grid solutions. The facility is in operation since 2002 and extends over an area of about 20,000 m2; it is interconnected to the MV Grid by means of a 800 kVA dedicated transformer (23 kV/400 V) and has an overall capacity of 350 kW (active power) and 300 kVAr (reactive power). 6 employees are constantly directly involved in the DER-TF management, operation and testing. Different types of DER generators are connected as PV Fields, , Wind Generator, Diesel Generator and natural gas CHPs (Internal Combustion Engines). The facility has an overall storage capability of about 230 kWh based on different storage technologies as Lithium, Flow (Redox), High temperature Nickel-Sodium and Lead (VLRA) batteries interconnected to the grid with dedicated converters. Resistive, Inductive and Capacitive Loads (overall capability of about 90 kW, 70 kWAr inductive and 150 kWAr capacitive are connected to the grid in order to simulate different typologies of actual users loads). The microgrid is configurable (locally or remotely) at the interconnection board in order to obtain different grid topologies: radial grids and also meshed configurations. There’s also the opportunity to extend feeders till one kilometre. The microgrid is able to operate grid connected or in islanded mode thanks to specific droop control algorithms implemented in some converters. The interconnection board (main bars and all feeders) and all the DERs are provided with electrical measure equipment, set up to collect and analyse the experimental data derived from the field test. For the future further installation of DER as well as an enhancement of the DC microgrid is planned. Description: The system (Euro Dish) is constituted by a parabolic dish (56m2, diameter 8.5 m) that concentrates the solar radiation in the receiver of a Stirling Engine (SOLO 161 , 10kWe) using helium as working gas. Description: The system, manufactured by Ausonia, is based on a 10 HP engine (Ruggerini) and an asynchronous generator (Leroy Somer) with a maximum capacity of 8kVA. Description: The storage system, manufactured by Sumitomo-SEI , is based on a 45kW stack (Voltage 100-155 VDC, Current up to 500 A) and an electrolyte (Vanadium Salt) circuits based on two 4000l thanks that guarantee a total capacity of 90 kWh. Description: The system, with a nominal voltage of 432 V, is based on SAFT VL41M NCA cells and is characterised by a maximum continuative discharge power of 69 KW and a maximum cont. charge power of 19 KW; the rated capacity is 80 Ah with an overall energy of 36 kWh. The storage system includes battery BMS, 100 kVA bi-directional AC/DC converter operating on 4 quadrants, and local control system. Description: The system, manufactured by Loccioni, has a nominal voltage of 532.82 V and is based on Samsung SDI LMO 60Ah cells and is characterised by a maximum continuative power of 30 KW (both in charge and discharge; the rated capacity is 60 Ah with an overall energy of 32 kWh. The storage system includes battery BMS, 37 kVA bi-directional AC/DC converter operating on 4 quadrants, and local control system NaNiCl Batteries; the system is based on Fiamm Nickel-Sodium high temperature batteries each one characterised by a nominal Voltage of 557 V, a maximum power of 32 kW and a rated capacity of 32Ah (energy 18 kWh). Each batteries has a BMS and up to three batteries can be connected in parallel to a 150 kVA bi-directional AC/DC converter operating on 4 quadrants. The system is completed by a local control system for batteries and converter management. Description: The system is based on 32 Fiamm Lead VRLA batteries (12FIT150 monolite) 12V, 150Ah connected in series for a nominal voltage of 384V, a maximum continuative power of 20 kW and a rated capacity of 150Ah (energy 50 kWh). The batteries are connected to a dedicated 22 kW bi-directional AC/DC converter operating at PF 0.8-1. The system can be directly connected to PV fields and loads in order to test off-grid operation. Description: A resistive/inductive remotely controllable load. Maximum power: 93 kW+69 kWAR. Load on single phases can be set independently in order to test not equilibrated configurations (3x31kW+3x23kVAr). Load control steps of 1 kW and 0.75 kVAr. Description: Low Voltage DC Microgrid (380 V, 100 kWe) capable to operate in islanding mode ore interconnected to the AC grid. The DC microgrid operates at nominal voltage of 380VDC with bi-directional interface inverter (100 kWE), two Zebra batteries (each 30kWp, 16kWh), two super-capacitors banks (each 30 kWp, 8 seconds), a PV emulator (30kWE), a DC fully controllable resistive load (30kW) connected to DC BUS by DC/DC converters and a DC programmable load (30kW) directly connected to DC grid. The grid can operate in islanded mode or connected to the main AC grid (DER Test Facility). Description: Turbo Power Systems Ltd – ENT400 a bi-directional converter (200kWE) able to generate a second independent net at variable voltage and frequency to test components behaviour at different grid conditions. The supplied system consists of two back to back inverters. One inverter is connected to the grid and supplies power to a DC bus. The other inverter converts the DC bus power to a three phase variable frequency, variable voltage output. The power supplied by the voltage source is up to 200kW at a power factor of >0.8. The face to face converter can be used as a Grid Simulator in order to test components and grid sections at different voltage and frequency. Description: A multistandard fast charging station compatible with all CHAdeMO, CCS and Type 2 AC vehicles currently on the road is connected to the Smart Grid. This charger is the ideal choice to serve all these electric vehicles. Typical charging times range between 15 and 30 minutes. Description: This test facility is a 60 m2 building epresenting a common residential flat with living room, kitchen, bedroom, and bathroom. This facility makes possible to carry out several tests on different energy management strategies but also simulates the user presence thanks to an appropriate sub-system which operates each single domestic appliance as it may do a real family living in a house. The independent data acquisition & monitoring system allows to evaluate the actual results of the different energy strategies. Description: Teamware Wally IP; Network analyzer for monitoring the quality of electric service. Approved according to ENEL DI 2201specifications. 5 Instruments. Description: RSE has set up a test facility located at Piacenza, in the North of Italy for performance of PV outdoor measurements. The testing facility is located in a place characterized by a global solar annual radiation of about 1400 kWh/m2 year. The test facility is also utilised in the frame of the large integrated Project APOLLON where round robin testing of CPV modules are performed to get comparable and reliable data. Description: The RSE DSM-EH is a 60 m2 building representing a common residential flat with living room, kitchen, bedroom and bathroom. The central element of DSM-EH is a Home Energy Manager & Gateway (GED), combining signal received from retailer (tariffs) and distributor (emergency) and user preferences regarding comfort and energy saving. In order to succeed with this management, several functionalities have been developed and tested. The main functionality implemented is the load and heating management, i.e. the possibility of switching off some appliances when particular circumstances occur or deciding whether it is better to use electric or gas devices for HVAC purposes. Description: It consists of a LV microgrid, connected to the MV grid by means of a 800 kVA transformer. It is constituted by several generators with different technologies (renewable and conventional), controllable loads and storage systems. DER-TF can provide electricity to the main grid with a maximum power of 350 kW. Description: Developed with different technologies: LAN Ethernet, Wireless and Power Line. A supervision and control infrastructure has been also implemented, providing several services: Interface with distributed resources (equipped with their local control systems): the control system gets measurement and sends commands and set-points; Archive functions: data storage and retrieval, in order to permit further analysis; Standard TCP/IP interface towards optimisation applications. Description: The RSE DSM-EH is a 60 m2 building representing a common residential flat where the central element of DSM-EH is a Home Energy Manager & gateway (GED), combining signal received from retailer (tariffs) and distributor (emergency) and user preferences regarding comfort and energy saving. In order to succeed with this management, several functions have been developed and tested. The main functionality implemented is represented by load and heating management, i.e. the possibility of switching off some appliances when particular circumstances occur or decide whether it is better to use electric or gas devices for HVAC purposes. Description: Consists of a photovoltaic plant (10 kWP), a lead-acid storage system, a diesel engine coupled with an asynchronous generator (7 kVA), a simulated asynchronous wind generator (8 kVA). 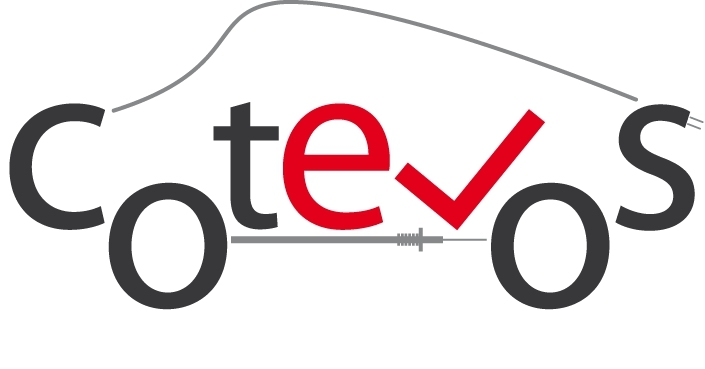 Description: RSE activities in the field of Electric Vehicles have a multidisciplinaryapproach and aim at evaluating the effects of electric mobility on the whole power system, addressing regulatory aspects and relations withsmart cities and communities. Studies concern the analysis of different scenarios of electric mobility, including evaluating their influence on air quality at local and national level; development and application of methods to predict and monitor the impact on the distribution power grid: i. e. evaluation of hosting capacity and dynamic grid behaviour. Experiments deal with technological aspects: interoperability; control and communication issues of V2G services; ultrarapid recharge and aging of batteries and super capacitors. Description: The PV laboratory is part of a low voltage test facility of distributed energy resources (RSE DER-TF) that can be used in conjunction with any PV system to simulate their behaviour in a dedicated grid (the test facility is already available as a RI in DERRI project, financed by EU). Peculiar aspects related to protections and to the energy quality can be analyzed using the RSE DER-TF. Quality management/testing protocols: Laboratories are certified according to ISO9001:2008. Power-Gen Europe Conference, Milan (IT), 21-23 June, 2016. (received best paper award). CIRED Workshop, Helsinki (FI), 14-15 June, 2016.